The Metro Crenshaw/LAX Light Rail Line will extend 8.5 miles, linking the existing Metro Exposition Line at Crenshaw and Exposition Boulevards to to the Metro Green Line’s Aviation/LAX Station and adding seven new stations within or in close proximity to the City of Los Angeles. The line is currently under construction and is scheduled to open in late 2019. 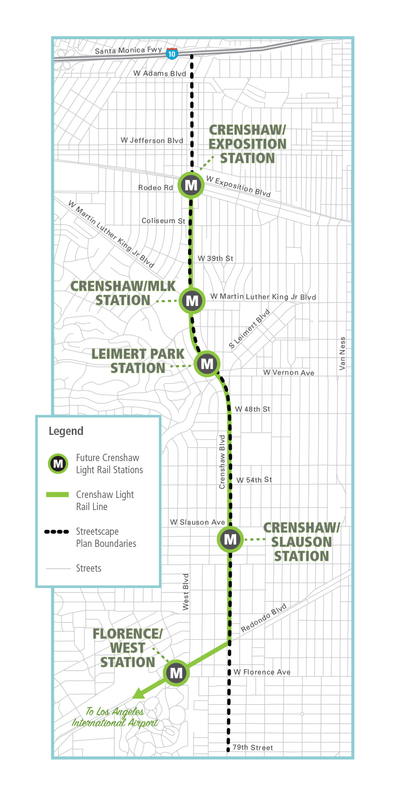 For more information on the Crenshaw/ LAX Light Rail Line, please visit Metro’s website at: http://www.metro.net/projects/crenshaw_corridor/. The Crenshaw Boulevard Streetscape Plan extends from Interstate I-10 Freeway to 79th Street and requires street trees, street furniture, lighting, and other features to create a more pedestrian-friendly street. The City will also amend the General Plan to give Crenshaw Boulevard a new, tailored street classification that will specify how the public right-of-way will be apportioned among roadway, sidewalks, bicycle lanes and the light rail, when the light rail is constructed. Click here to learn more about the streetscape plan. The Crenshaw Boulevard Streetscape Plan complements and implements the West Adams-Baldwin Hills-Leimert New Community Plan. For more information about the West Adams Community Plan, please visit https://sites.google.com/site/westadamsncp/. The Department of City Planning is also developing regulatory tools and strategies for the Century/Aviation Station near Los Angeles International Airport (LAX). Click here to learn more about the Century/Aviation District Plan.